The following article appeared as part of a larger bi-weekly business-school news roundup in The Globe and Mail on Nov. 14, 2014, written by Jennifer Lewington, Special to The Globe and Mail. Live case competitions – based on a real question posed by a real company in real time – usually are reserved for senior business undergraduates and MBA students who have learned the fundamentals of finance, marketing and corporate strategy. This fall, Wilfrid Laurier University’s school of business turned the traditional model on its head. On the first day of classes in September, first-year business administration students were given a question posed by Samsung Canada: What partnerships could the electronics giant pursue to expand its market share in smartphones, televisions and tablets? “I thought a live case competition will motivate them to work harder and will make the whole situation more realistic,” says associate business professor Sofy Carayannopoulos. By tapping the known enthusiasm of business students for competitions, she saw the live case as a way to strengthen their ability to carry out research, write and think critically – skills demanded by employers. On a recent Saturday, cheered on by 300 classmates, friends and family, six student teams in the finals presented recommendations to a six-member jury that included three Samsung executives. “It was an unreal opportunity,” says Anthony Cedri, a member of the winning team that suggested an alliance between Samsung and Porter Airlines. Given growth in the airline industry, the team suggested the use of Samsung tablets for in-flight entertainment currently not available on Porter flights. After a 10-minute presentation, each team was grilled by the jury for another 10 minutes. “The kinds of questions that we were exposed to and had to answer are the types of questions we will be answering in the real world,” he says. Samantha Sells, a double major in business administration and financial math, says Prof. Carayannopoulos’ decision to create a live case competition sent a strong message to first-year students. “It was the realization that we were in the big leagues,” says Ms. Sells. “We would be presenting to people who might take action on the ideas we had.” Her team placed fourth. Early in the course, students drafted their own report on Samsung and potential marketing partners. After completing their assignment, students were assigned to teams who competed in two rounds of competition before the finals. The teams had only a week to pull together a presentation of financial and other analysis. Prof. Carayannopoulos developed the case in collaboration with Samsung, working with Laurier alumni Nick Lazic, manager of content and services for the company. He and other executives participated in a live-streamed question and answer session with students in late September. For Samsung, seeking to expand its corporate footprint in postsecondary education, the live case provided direct access to a youth market. 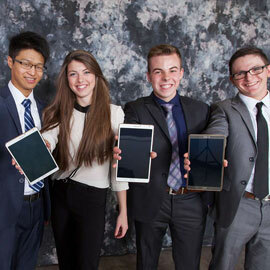 The winning team received eight-inch Samsung tablets, with prize money of $150 to $300 for team members. Based on the performance of the first-year class over the semester, Prof. Carayannopoulos is ready to do a live case again. “For first-year students only six weeks into the program, they were doing very good work,” she says.